Free Practice: In the free practice sessions the Kaufmann Drivers were running on a good pace. 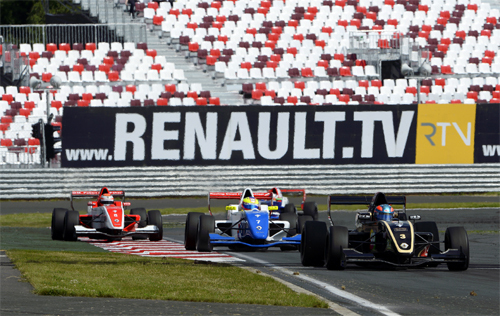 Tunjo was P3 and P4, Schothorst P12 and P18, Gustav Malja on P13 and P19. Qualifying 1: In Group A it was Tunjo and Schothorst showing a strong qualification, with Schothorst on P2 and Tunjo P4. Malja in Group B was on P10. On the Grid: Schothorst P3, Tunjo P7 and Malja P 20. Race 1: Tunjo stalled the engine at the start and dropped back to the end of the field. He finally finished P18. 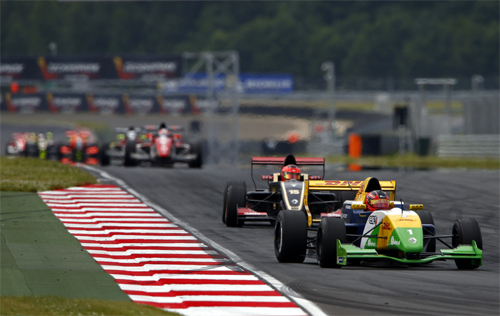 Gustav Malja improved himself to P17 during the race. Steijn Schothorst had a good start and was pushing in the front of the field. 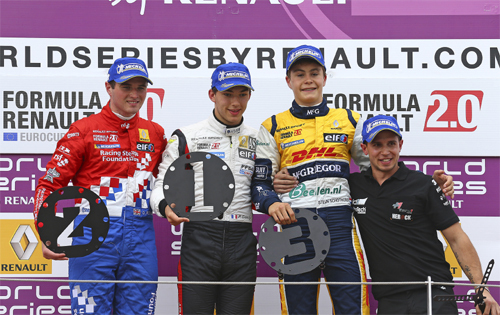 He drove fast race laps and didn´t make any mistake which finally secured him his first podium on P3. Qualifying 2: Malja in Group B only on P12 again. In Group A Schothorst was on P8 and Tunjo on P3. On the Grid: Tunjo P6, Schothorst P16 and Malja P23. Race 2: Schothorst and Malja both were able to overtake a few other drivers but couldn´t find the way in the points. Schothorst P14 and Malja P19 in the end. Oscar Tunjo had a strong opening lap and improved himself to P4. Although he was putting pressure on the car infront he couldn´t overtake and finally finished on a good P4.